Rare 1741 8 reales treasure cob coin mounted in high quality custom-made solid 14kt gold pendan..
1 Reale Treasure Cob Coin Mounted in a beautiful Solid 14kt yellow gold seahorse pendant, w..
1 Reale Treasure Cob Coin Mounted in Solid 14kt Gold hand-made Pendant&nb.. AUTHENTIC PIECE OF EIGHT TREASURE COIN 2 ESCUDOS GOLD Mounted in a s..
2 Reales Treasure Cob Coin Visible Date: 1694 Mounted in a handsome hand-made S.. 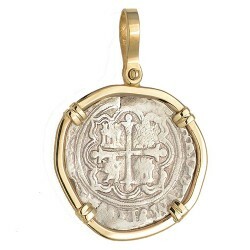 AUTHENTIC PIECE OF EIGHT TREASURE COIN 8 Reales Treasure Cob Coin Dated 1..
Spanish Colonial 8 Reales Treasure Cob Circa 1620's Mounted in a beautiful h..
1 Reale Treasure Cob Coin circa 1556-1598 Mounted in a beautiful Solid 1..
1 Reale Treasure Cob Coin circa 1556-1598 Mounted in a beaut..
1 Reale Treasure Cob Coin Minted in Potosi, Bolivia circa 1598-1621 This piece of eight cob co..
1 Reale Treasure Cob Coin Mounted in Solid 14kt Gold with Genuine Emerald Nicely srtuck and ..
1 Reale Treasure Cob Coin circa 1556-1598 Mounted in a handsome high quality hand-..
1 Reale Treasure Cob Coin Mounted in Solid 14kt Gold Pendant Lima, Peru Min.. AUTHENTIC SPANISH AMERICAN 1 REALE TREASURE COB COIN Mounted in a beautiful..
High grade authentic 2 Reales Treasure Cob Coin Treasure coin pendant measures 1 5/8" tall a..
High grade authentic 2 Reales Treasure Cob Coin , circa 1600's Mounted in a high qualit..
High grade authentic 2 Reales Treasure Cob Coin dated 1753 Treasure coin pendant measures 1 1/2.. Authentic 2 Reales Treasure Cob Coin with Visible Date: 1733 Mounted in a high&nb.. Authentic 2 Reales Treasure Cob Coin with Two Visible Dates: 1766 Mounted in..
4 Reales Treasure Cob Coin Mounted in Solid 14kt Gold Pendant Mexico City, Mexi..
4 Reales Treasure Cob Coin Mounted in Solid Sterling Silver + 14kt Gold P..
1/2 Reale Treasure Cob Coin Minted in Potosi, Bolivia circa 1556-1746 This piece of ei..
1/2 Reales Treasure Cob Coin Minted in Lima, Peru during the reign of King Philip II circa 1..
1/2 Reales Treasure Cob Coin Minted in Potosi, Bolivia during the reign of King Philip IV ci..
2 Reales Treasure Cob Coin Mounted in Solid 14kt Gold Pendant Potosi, Boliv.. AUTHENTIC PIECE OF EIGHT TREASURE COIN 1 ESCUDO GOLD COB COIN Mounted in a ha..